The Home Ministry asked for a report from the Bureau of Immigration after Ferdous Ahmed's presence at a Trinamool roadshow triggered controversy. Ferdous Ahmed (left) seen campaigning for the Trinamool Congress in West Bengal. Famous Bangladeshi actor Ferdous Ahmed's role as star campaigner for the Trinamool Congress in the Lok Sabha elections in West Bengal has been written off by the centre. The 45-year-old actor will be sent back and blacklisted for violating his visa conditions. According to sources, the Home Ministry had asked for a report from the Bureau of Immigration after Mr Ahmed's presence at a Trinamool roadshow triggered a controversy. The Ministry has now cancelled his business visa and issued him a "Leave India" notice. "He also has been blacklisted. FRRO (Foreigners Regional Registration Office) Kolkata has been directed to ensure compliance of these orders," a senior bureaucrat in the ministry said. The FRRO is responsible for providing visa services to all foreigners. The decision could open a new front between Mamata Banerjee's Trinamool Congress, which rules West Bengal, and Prime Minister Narendra Modi's government at the centre. The two sides share an acrimonious relation that has grown even bitter ahead of the ongoing polls. According to the Home Ministry officer, granting visas is the right of Government of India and the state has no role in it. "A foreigner can't come to India and campaign for a political party," he added. The Home Ministry insisted that they are not looking at the case from a political standpoint. It is a matter of rules and regulations, they said. 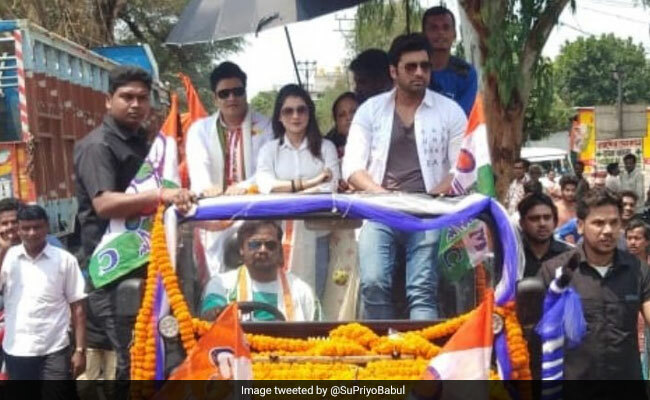 Reports said that Ferdous Ahmed, who works these days in India's Bengali film industry, campaigned for Trinamool's candidate Kanaia Lal Agarwal from Raiganj in West Bengal's North Dinajpur district on Sunday. He was seen along with two other Bengali actors, Ankush Hazra and Payel Sarkar in the area close to the Indo-Bangladesh border. Mr Ahmed is said to be visiting India on a business visa. The Deputy High Commission for Bangladesh also asked him not to take part in the election campaign in India and return to his country.